(PRLEAP.COM) June 22, 2015 – Richard Stiennon, author of Surviving Cyberwar (Government Institutes, 2010) and UP and to the RIGHT: Strategy and Tactics of Analyst Influence (IT-Harvest Press, 2012) has written a new book. 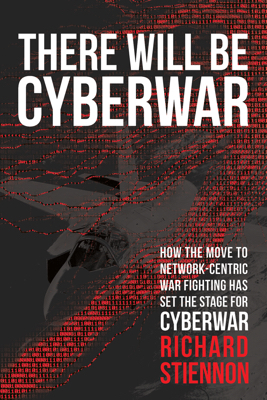 There Will Be Cyberwar chronicles the move on the part of the US Military to a network-centric war fighting capability. NCW is the use of networked sensors, Command&Control, and precision weapons systems. There Will Be Cyberwar provides a concise definition of cyberwar: the use of computer and network attacks to further the goals of a military operation. It goes on to demonstrate that the US Military in particular has done little to defend the components of NCW from cyber attack. Paperback and Kindle editions of There Will Be Cyberwar are available from Amazon and participating bookstores and libraries. Stiennon bio: Richard Stiennon is Chief Research Analyst for IT-Harvest, the firm he founded in 2005 to cover the booming IT security industry. He is the author of Surviving Cyberwar (Government Institutes, 2010). He is a member of the advisory board at the Information Governance Initiative and Senior Fellow at the International Cybersecurity Dialogue. He was Chief Marketing Officer for Fortinet, Inc. and VP Threat Research at Webroot Software. Prior to that he was VP Research at Gartner, Inc. Stiennon writes the Cyber Domain column for Forbes.com and has presented on the topics of cyber threats and defenses in 28 countries on six continents. He has a B.S. in Aerospace Engineering and his MA in War in the Modern World from King’s College, London.